STASI BELLOMY was born and raised in Gresham Oregon, a suburb of Portland. 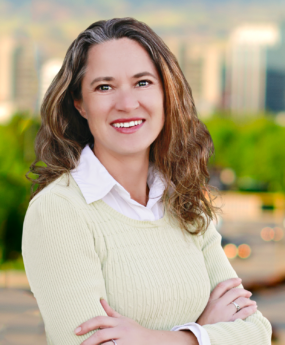 She’s traveled and lived in other cities and loves to call Boise home. She moved here in April of 2009 to be in the same city as her soon to be husband. She married her husband in 2010 who is a devoted teacher. They have two kids a 9, year old stepdaughter and a 5, year old son. Their furry kids are a 2-year-old, black lab Mo’Glee and a 16-year-old Himalayan cat named peaches. She worked in customer service for most of her working career and decided in 2015 after her son started school it was time for a change to start giving back and doing what she loves. Meeting new people and helping them find the treasures that they call home! She loves to form new relationships and serve in different capacities at her home church and any area she is needed. She loves to go to the beach, (any beach) if there is sand and ocean, also loves to travel and go camping, going on road trips and spending that extra special time with her family. When she works with her clients she is sincerely interested in their needs and wants for any of their needs not just real estate. She wants to be the go to person they call when they have any questions. She feels the highest compliment in her business is a referral from one of her clients, friends or family.